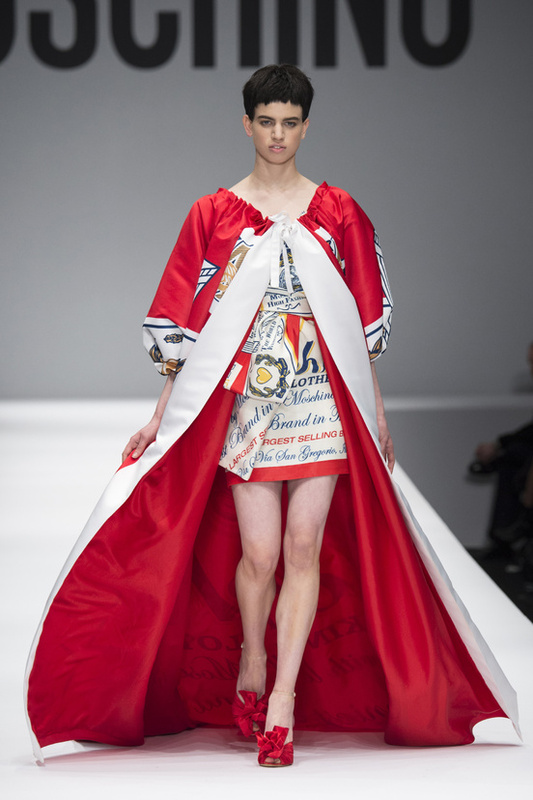 Budweiser® has influenced one dress in the Moschino by Jeremy Scott Autumn/Winter 2014-2015 Collection. 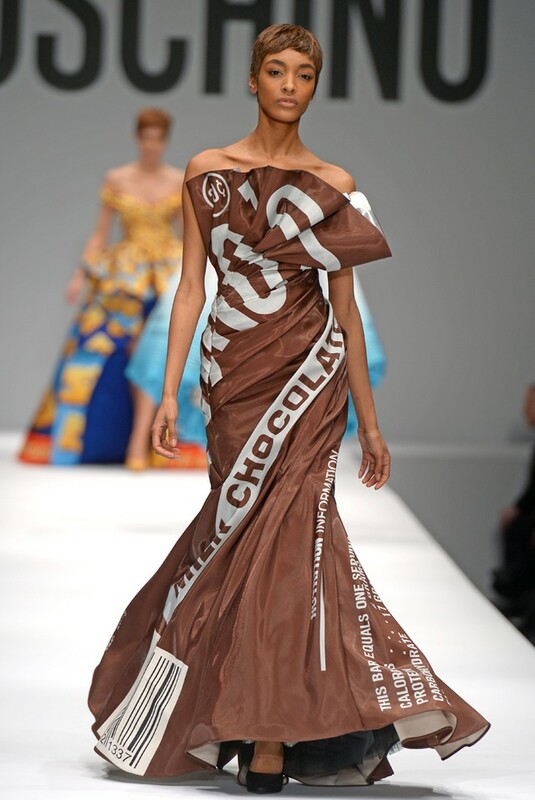 Other Budweiser®-inspired looks : Dsquared² Spring/Summer 2010 (some models of this camping-themed show carried Budweiser® 40oz bottles), Moschino by Bill Shapiro and Rossella Jardini Spring/Summer 2013 Menswear (this show, which, as an homage to Andy Warhol, paid tribute to the graphic power of the supermarket, featured a pattern which was based on the Budweiser® logo). 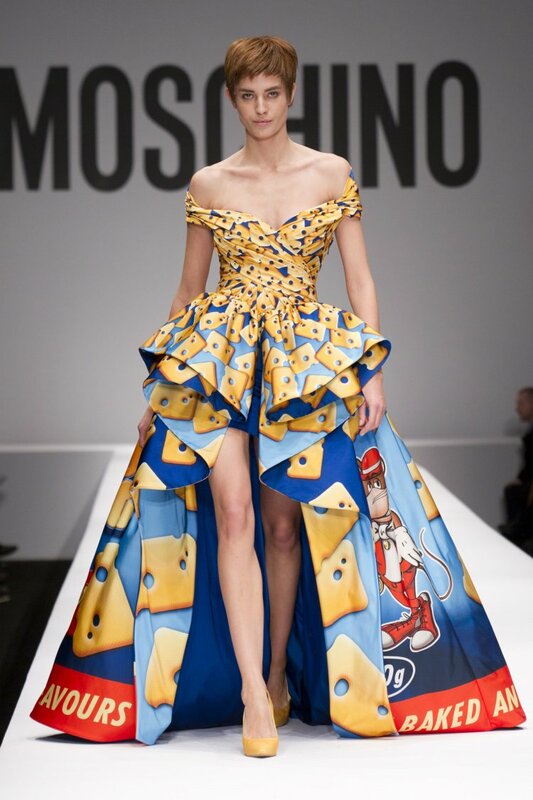 One dress in the Moschino by Jeremy Scott Autumn/Winter 2014-2015 Collection references popcorn packagings. 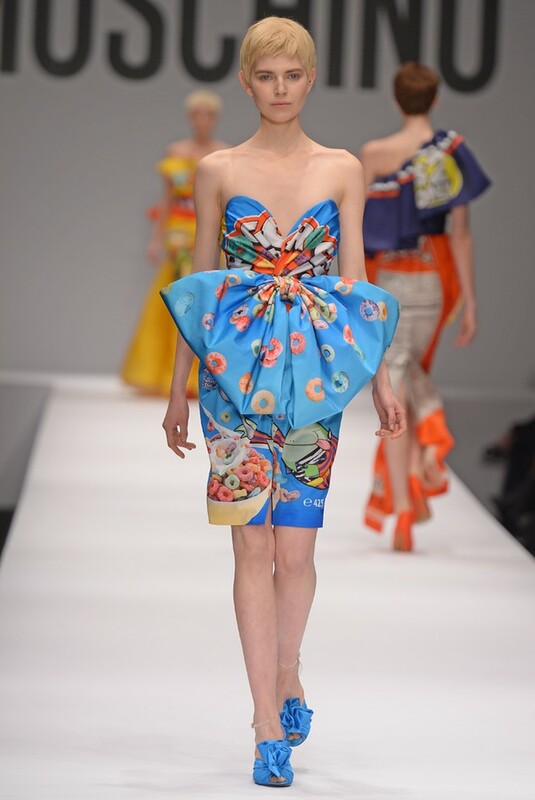 Other popcorn-inspired items : Charlotte Olympia Pre-Fall 2013 (titled « Hollywoodland », this collection featured popcorn packaging-shaped clutch), Jeremy Scott Autumn/Winter 2006-2007 (this show, dubbed « Eat the Rich », highlighted « popcorn » earrings), Nibbles (in 2008, Lucy Folk launched a line of accessories which featured real popcorn coated in precious metals), Siki Im Autumn/Winter 2012-2013 Menswear (this show unveiled « popcorn » patterns on various half-skirts), Tatty Devine Spring/Summer 2008 (this collection, titled « Movie Mayhem », showcased « popcorn » necklaces). 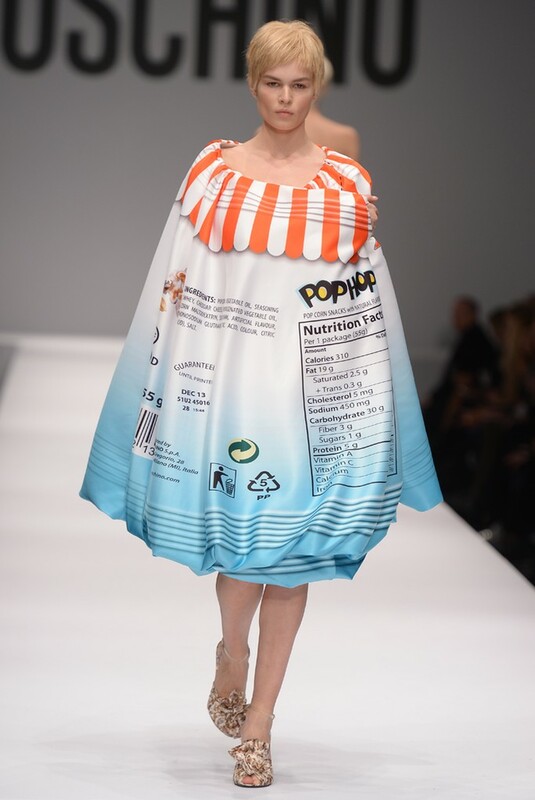 One dress in the Moschino by Jeremy Scott Autumn/Winter 2014-2015 Collection reimagined Froot Loops™. 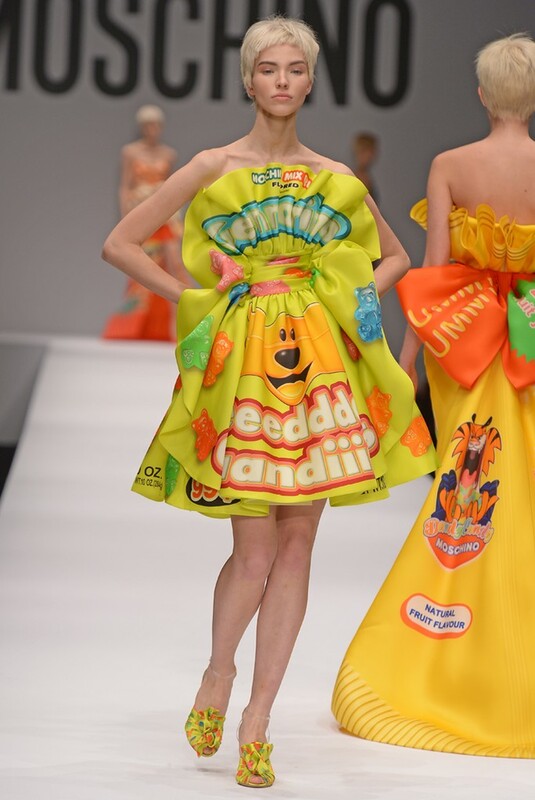 Gummy bears have influenced dresses in the Moschino by Jeremy Scott Autumn/Winter 2014-2015 Show.